Momentum has slowed for Twitter, but some charts suggest it could double from here. The charts of Twitter (TWTR) were reviewed not quite one month ago, where I suggested that "The price gap on TWTR is relatively new but the uptrend got started back in September and is likely to persist. Longs should continue to hold and raise stops to a close below $29." In the past month TWTR has not declined to close below $29 so traders should still be long and the new highs for the move up this month keeps the bull in control. How do things look now? In this updated daily bar chart of TWTR, below, we can see that prices moved above $34 to new highs but trading volume really did not expand much. The daily On-Balance-Volume (OBV) line inched up very slowly and has made a new high, just not a convincing one (interesting how a math driven indicator can be subjective). The Moving Average Convergence Divergence (MACD) oscillator is above the zero line in bullish territory but could cross up or down depending on the price action in the days ahead. Prices are above the rising 50-day and 200-day moving average lines but prices look extended compared to recent history. In this weekly bar chart of TWTR, below, all the indicators are in a bullish alignment. Prices are above the rising 40-week moving average line. The weekly OBV line is pointed up nicely and the MACD oscillator is clearly bullish on this time frame. 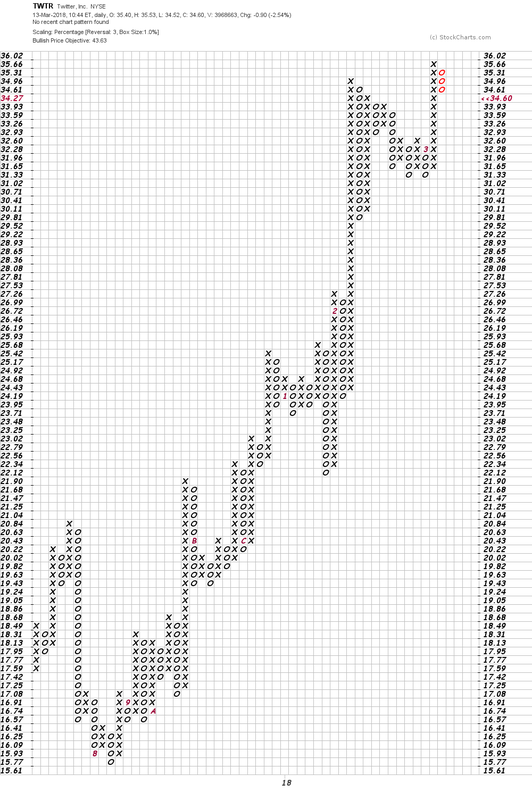 In this first Point and Figure chart of TWTR, below, we can see the uptrend and a potential price target of $43.63. 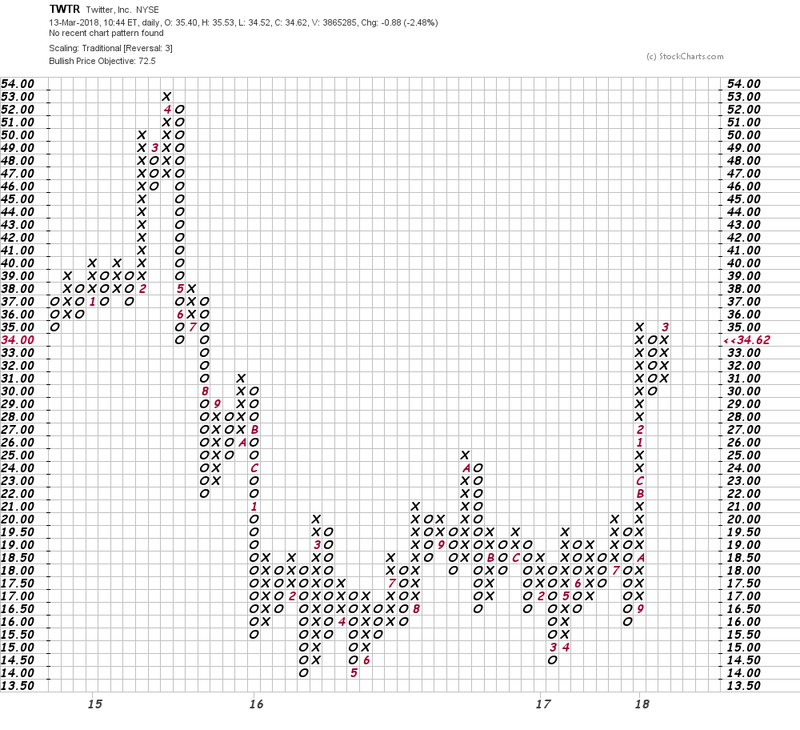 In this second Point and Figure of TWTR, below, we can see a two-year base pattern and an upside breakout at $26. A long-term and ambitious price target of $72.50 is shown. This target would be nearly a double from current levels. We have seen many doubles in the past few years so we cannot rule it out and maybe that price could be reached in an M&A deal. A decline below $30 would weaken this chart and that could be more important in the short-run. Bottom line -- upside price momentum has slowed and is diverging from the new high this month (chart not shown). Volume and the daily OBV line are not impressive. Yes our Point and Figure charts suggest much higher prices but in the short run I would raise stop protection even higher to a break of $30.50.